building loyalty and informing customers. According to research, people are spending more and more time on their smart mobile devices. And the trend is getting bigger by the minute. Have you started taking advantage of the opportunities the mobile technology has to offer? Are you truly in touch with your customers? Over 50% of your customers are already using a smart phone. People spend around 200 minutes per day using their mobile devices. Smart phone users spend 89% of their time using mobile apps. 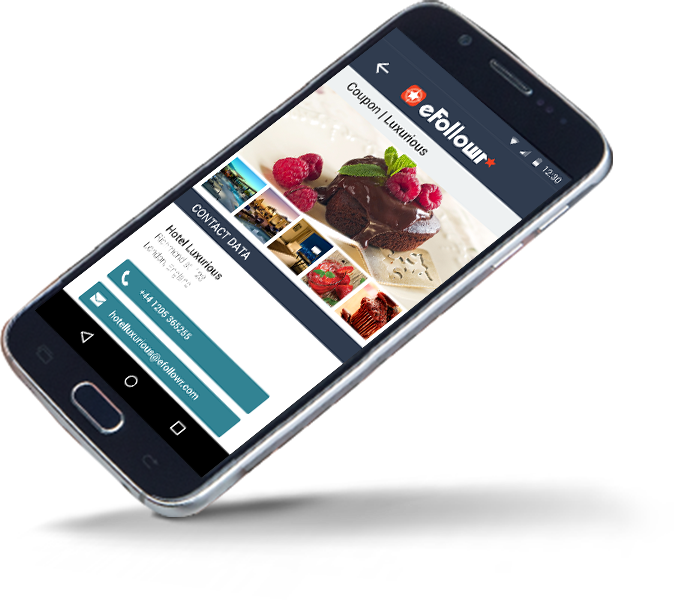 eFollowr allows you to share information and offer deals in an innovative way while keeping it simple. Just as it should be. 1 | The user scans your QR code or starts following your company on the mobile app. 2 | You choose a way to reward your customers, such as collecting coupons, collecting loyalty points, Happy Hour, or other. 3 | Choose the time and place and inform your customers or followers about the rewards. 4 | Your followers can visit your location and use the reward of their choice. 5 | You can now analyze other deals and shopping habits of your customers. Unlimited possibilities of being connected to your followers! There is only one eFollowr, but it’s able to adapt to your needs completely. It suits small, middle-sized and large businesses, regardless of their main activity. It allows all users to be anonymous and independent. Quick deals | Launch a new deal in an instance. Happy hours | Are you left with a couple of sandwiches that you weren’t able to sell? Create a Happy Hour and inform your followers. LOYALTY CARDS | Managing loyalty cards has never been so easy. And no plastic. Hurray! SENDING AND TRACKING COUPONS | Send and track coupons using eFollowr and say goodbye to manual record keeping. NEWSLETTERS | Tell your customers about the upgrades that are coming. With unlimited possibilities of communication, eFollowr allows effective internal messaging. LOCATION | Inform your customers where it matters the most. Close to your café, store, or business. TIME | Select the date and time of your offer and share the good news. EVENT | Choose how you want to pamper, motivate and reward your customers. Everything else happens automatically. Want to experience eFollowr in action? 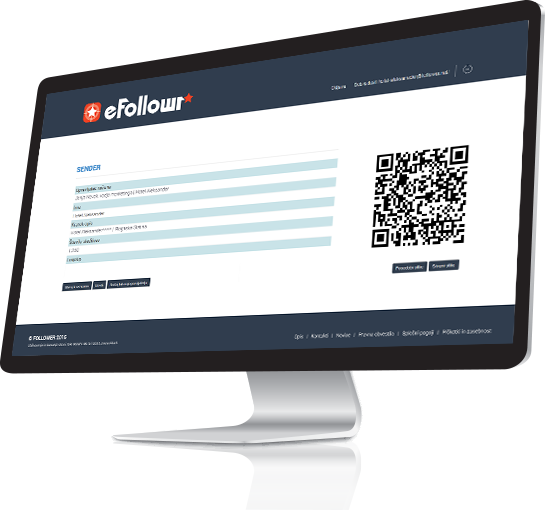 *eFollowr program consists of eFollowr website and eFollowr mobile app. Congratulations! You have successfully signed up for DEMO eFollowr. We are pleased you have decided to take an innovative step towards the future. Help us build loyalty and inform your customers about new things and special offers. We will soon be in touch for more information. Should you have any questions, you can reach us at +386 51 436 436 or info@efollowr.com. We will be happy to answer your questions. See you soon! eFollowr. A fully adaptable system for building loyalty and informing customers. Stay connected to your customers in a way you always wanted! Website concept and design: Oblikovalski studio Jasna Ekart.